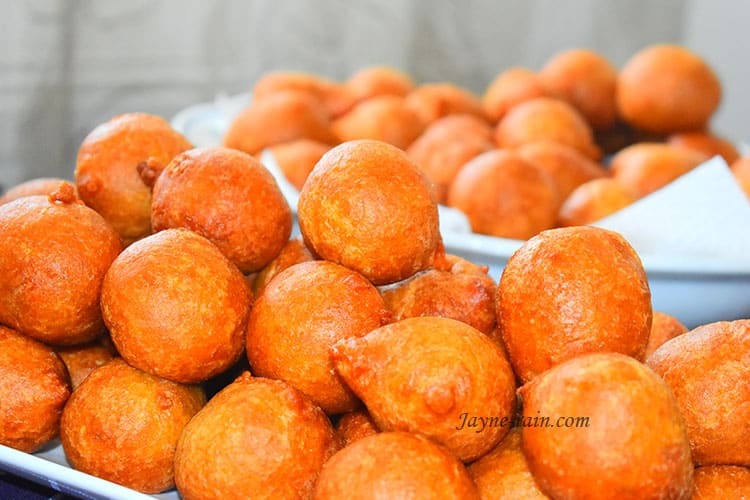 Puff-puff as West Africans call it, is a traditional snack made of dough containing flour, yeast, sugar, salt, and water. People add other ingredients like nutmeg and milk depending on the recipe, preference, and region. The dough is deep-fried and then rolled in sugar, dipped in hot sauce or just enjoyed on its own. In West Africa though, puff puff is typically accompanied with some Beans curry and west African pepper sauce. Either way, this recipe is worth trying. Puff puff is a delicacy that doesn’t lack on the streets of Africa, and I haven’t been to any party that lacked them either. I think it because they are so easy to make and perfect for feeding a crowd. This delicacy has a slightly crunchy crust with a soft and airy interior, perfect as a snack, for breakfast or any other time of the day. I learned how to make puff puff more than 13 years ago from my sister-in-law and quickly discovered my love for this scrumptious deep-fried dough. I love it so much that I literally won’t rest till I have devoured the last one. It proves that puff puff is so addictive. To start the process, I always use a large mixing bowl for my batter. It is because the batter needs to proof and I never want it spilling over during the process. I place all my ingredients in the mixing bowl and mix well using a large egg-whisk for about 5 minutes until my batter is smooth. Equally, make the mixture in a stand mixer. After that, I cover the mixing bowl with cling wrap and allow my batter to proof for nothing less than 1 1/2 hours. The proofing process is crucial for the overall flavor and texture of your puff puff. Therefore, don’t rush it. When I have time, I allow my batter to proof twice for a more structured interior. Now let us move to shaping the puff puff. I start by scooping enough batter to fit in my palm. I then squeeze a little batter at a time through my thumb and the index finger into the hot oil. You can also use a spoon or an ice cream scoop to make round puff puff. Just dip the spoon or ice cream scoop in cold cooking oil before scooping the puff puff batter. It ensures easy release of the batter from the spoon. Making round puff puff might seem challenging if you are a beginner, but once you get the hang of it, it’s easy. After all, practice makes perfect, right? 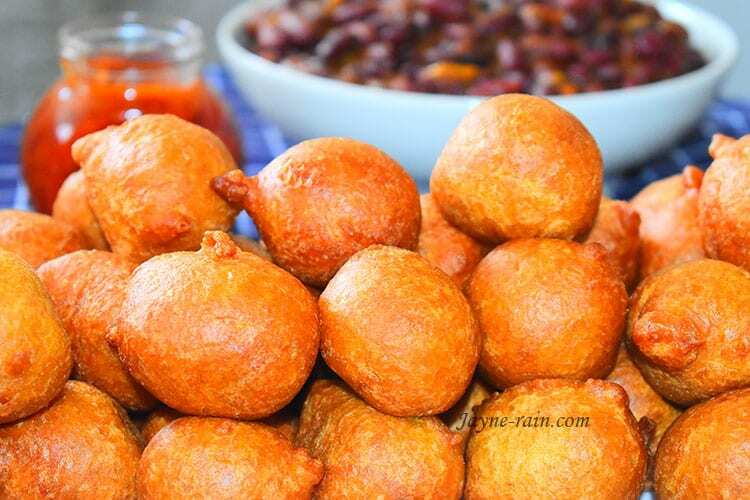 There is a similar version of puff puff know as Mandazi ya Maji in East Africa. Puff puff contains flour, yeast, sugar, salt, water and other ingredients depending on the recipe and region. The pastry is deep-fried and rolled in sugar or dipped in hot sauce depending on preference. In West Africa, people typically accompany puff puff with some Beans curry and west African pepper sauce. In a large mixing bowl, add the warm water, sugar, salt, and yeast. Give a quick mix. Meanwhile, add the flour to the yeast mixture and mix thoroughly with a whisk or a wooden spoon for 5 minutes or until you achieve a smooth lump-free batter. Cover the mixing bowl with a plastic wrap and set aside in a warm place to rise for about 1 ½ hours. In a large saucepan, heat the vegetable oil. Taste if the oil is hot enough by dipping in a tip of a wooden skewer. If it sizzles, the oil is ready. Scoop enough batter to fit in your palm and squeeze a little batter at a time through your thumb and your index finger into the hot oil. Repeat the procedure for the remaining mixture. Make sure you do not overcrowd the pan. Turn continuously to make sure that they cook evenly on both sides and develop an even brown color. It will take a few minutes. Fry in batches. Alternatively, you can use an ice cream scoop or a spoon to scoop the batter. Just dip the spoon in cold oil before scooping. It ensures a smooth release of the mixture. Use a large spoon to remove the puff puff from the frying pan. Place them on a kitchen napkin to soak up the excess oil. If the oil is not hot enough, the puff puff will stick to the bottom of the frying pan and not puff well. Use a large mixing bowl because the dough is going to double in size during proofing. What do you think about this Puff Puff recipe? Have you tried it out? Meet me in the comment section below and share your thoughts because I would love to hear from you. If you like this recipe, you might also be interested in my Mandazi recipe. OMG, this looks so mouthwatering and delicious. Mouthwatering indeed. Thank you, Yvette, for stopping by again. I appreciate. 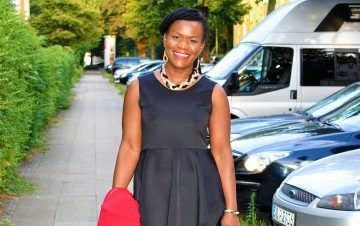 Hi, I tried this recipe and the puff puff taste really good. But I still need to work on my shaping technique. Also I used part water part milk. When it comes to shaping, practice makes perfect. Just hang in there Victoria.